It's time again to post my New Year's resolutions. I make various goals throughout the year (including a new resolution to eat better, which I started the first week in December), but I always like the idea of taking stock and starting fresh goals after the holidays. First, let's check in with my 2017 resolutions and see what was or wasn't accomplished. 1. Finish my manuscript by the end of winter. = accomplished. I finished a first full draft and had my consultation with my mentor. I'm now slowly working through the revisions. 2. After receiving my manuscript notes from a UCLA Extension faculty member, use the notes to revise and polish my novel. Send my novel to potential agents. = Sort of. I'm still revising, not at the agent stage yet. 3. Finally figure out a sensible and effective writing schedule, which includes becoming more involved in my online writing group- submitting more, rather than just critiquing. = Fail. The online writing group was distracting, so I dropped it. My writing is spotty, in bursts and not consistent. 4. Submitting short stories and poems to contests/ journals. I'm not going to give myself a quota like last year, but I need to put myself out there. = Sort of. I entered the NYC Midnight Short Story competition and passed the first two rounds. It was a lot of fun and I came away with two solid short stories. 5. Read a Minimum of 70 books. = Accomplished! I'm writing this review with a few weeks left in the year, but it looks like I'll end up with 78-79 books read. I also read many literary journals, not included in this count. 6. Cut out soda- This was a resolution that I stuck to for many years, but have slipped back into old habits this past year. Not that I drink a lot of soda, but still getting rid of empty, unhealthy calories.= Fail. I don't even remember this as a resolution for last year. Although, I have been soda free since December 1st. 7. When not traveling, use apartment gym a minimum of three days a week. I hate exercising, but need to get back into the routine. I had an amazing exercise routine for nearly two years and I felt, looked fabulous. I need that back. = Major fail. I used the gym, but not consistently. I also joined a gym in Big bear, but I've already canceled the membership. Part of the problem is I got sciatica in May and I've not felt well every since. Yoga helped a little, but I'm still having lingering issues. 8. Maintain a food diary and eat a minimum of five servings of fruits and veggies a day. This is for awareness, which will hopefully turn into healthy habits, something that's worked like a charm in the past. = Fail. Although I've been doing this for a few weeks and it does work! 9. Learn to enjoy living in Downtown Portland- get out of the apartment weekly to take advantage of what the city has to offer. Be present and active in our current living situation. = Sort of. I never learned to enjoy living in Portland, but we did make the most of it. We got out and saw things, attended local activities. My attitude did change towards living in Portland, but I was happy to move back to CA! I'm grateful for the experience of living in the Pacific North West and new friends made. 10. Travel to a new state or country ( or major city) = Yes! I went to Oklahoma City for the first time. We also visited Skagway, Alaska. We took many short trips around Oregon and Washington, seeing new things. My favorite was going to Astoria and seeing where one of my all-time favorite movies, The Goonies, was filmed. 11. Grow Travel Agency, by focusing on training, social media and the Easy as Pie Travel blog. I'm proud of what I've built so far and I've booked vacations for several clients, however, I want to be bigger. = Fail. We opted to close the travel agency, because it was more work than it was worth putting in to build. It distracted from my writing. No regrets with this one. Again, nothing to regret from the experience. 12. Grow the Always Packed for Adventure blog. Truly, this blog and it's readership has exceeded my expectations, but that makes me think that I can do even better.= Accomplished. My blog continues to grow in readership every month. It's exciting! And now, time for those 2018 resolutions! I'm planning on starting most of these on January 8th, after my stepson finishes his visit with us for the holidays. I just want to have fun during his visit and not worry about schedules and goals. 1. Create a writing schedule with a focus on the revisions for my novel. 2. Finish revising my novel and begin sending it out to agents. 3. Maintain blogging schedule of every other day. This has been my normal schedule for years, but life got in the way this year and I didn't always stick to it. I felt guilty when I didn't. 4. Read 75 or more books. 5. Maintain a food log and eliminate soda. 6. Work on scanning old-family pictures. Try to get 1/4 of pictures scanned. This has been a resolution from years past that I never managed to accomplish. It's a big project. 7. Work on family genealogy project. 8. Super secret podcast idea- put into action! I'm very excited about this one. 9. Visit a new country, state or major city. 10. Attend a writer's conference. I have my eye on the Las Vegas conference in the spring. Happy 2018 and thank you for reading my blog! May your year be filled with happiness, good health, and new adventures! We rang in 2017 with Dan's family in England! This was my first time spending the holidays in England, so it was wonderful to both be with family and to experience British traditions. Dan's sister's family treated us to a pantomime show, my first ever! We did a family trip to the Cadbury Factory and went to Warwick Castle. The weather was cold, but after spending a few months living in Portland, I handled it like a pro, meaning I finally own cold- weather appropriate clothes. The weather was bleak for most of our time in Portland. We bought a S.A.D. Lamp (which totally works) and popped vitamin D pills. I was not prepared for the affect that the seemingly endless days of grey skies would have on both my mood and energy levels. Coming from Los Angeles, I'm used to blue skies, sunshine, and things being open. The weather shuts things down in Oregon. We had to wait until the late spring to experience many of the local national parks and theme parks. I love going to movies, but we really struggled to find winter activities that got us out of apartment that didn't include movie theaters, malls, and coffee. Again, all things I love, but growing up in Los Angeles, I definitely took for granted that living in a city with so many things to do. Portland is small. It doesn't have good sushi. It does have superior coffee. All of the locals told us to wait until summer. I was a little worried, because more than one local (I took an informal poll from whomever we came in contact with) told us that the summer weather starts after July 4th. Yikes! We started having nice days in May and by June, it was beautiful out. We went to Mount St. Helen's National Park ( closed sept-may) and Mount Hood. We visited Multnomah Falls, The Bridge of the Gods, and the Bonneville Dam Fishery. The Bonneville Dam is actually a really cool spot, you can see salmon jumping over locks and view Lamphrey, a fish that is made of nightmares. Look it up. We visited Astoria and Cannon Beach to see filming sites from The Goonies. The summer weather was beautiful and everyone in town seemed happier. We did get out of Portland a few times before summer. In February, we went to our home in Big Bear and had friends stay with us. In April, we spent a week in Las Vegas for Dan's annual work trade show. He worked hard and I sunbathed. At the end of our Vegas week, we hosted friends from Portland at our Big Bear home. During spring break, our friends from Big bear visited Portland and we went on a short trip to Salem with them to do wine tasting! Zoe and Felix stayed with us for six weeks during the summer. We had two mini-vacations during their stay. The first was one a Princess Cruise to Alaska. We wanted them to experience Alaska and glaciers, plus being in Portland, this was an easy trip for us. I thought the highlight was a rafting excursion near the Mendenhall Glacier. I've always wanted to go white water rafting and although this was a fairly mild excursion, we did get on class 3 rapids. So much fun! Skagway was a favorite town, that Dan I didn't experience during our previous Alaska cruise. In Skagway we ate lunch in a former brothel and saw one of the longest running stage plays in America. We also went to an Iditarod training camp and held husky puppies. In Ketchikan, we watched "The Great Alaskan Lumberjack Show,"= think medieval times, but with lumberjacks. The cruise also did a scenic journey through Glacier Bay National Park. The other mini-vacation was a week in Las Vegas for pool time and extreme heat. It's just not summer with out the desert heat. We visited the Hoover Dam and saw Criss Angel's latest magic show at Luxor. In Portland, we took the kids to The Oaks Amusement Park for rollerskating and rides. They really loved the Portland Children's Museum too. A highlight was Dan's company picnic, which was held at Providence Park, home of the Portland Timbers. We were allowed to run around on the soccer pitch, where Zoe did endless rounds of cartwheels. The same day that Zoe and Felix left, my mother-in-law arrived for a three week visit. This was her first time in Portland, so we made the rounds of the tourist sites. My favorite was having tea with her at the Japanese gardens. It was my 40th birthday during her visit, so we made a quick trip to Big Bear, so that she could see the house that was remodeled and I could be in California. A few days after my mother-in-law left, we had our friends (Dave, Cath, and pug, Jewels) visit for the eclipse. We decided against driving twenty minutes to be in the "Path of Totality" and only experienced 99% of the eclipse. That 1% makes a difference. There was so much light. It was still neat, but not life-altering, as people were mentioning on the news. In late August, we moved back to Big Bear. I miss our friends made in Portland, but I'm really happy to be back home. In September, I got a job in social media and marketing for one of the local vacation rental companies. Dan splits his time working from home and traveling to Portland to be in his office. I'm still working on my novel, in the revision stage after meetings with my mentor. Life is busy! In September, I had an amazing opportunity. My friend Ryan and his wife Shawna, brought me to Oklahoma City to take part in their Ricochet: a Storyteller's Show podcast. The whole experience was incredible. It was also my first time visiting Oklahoma. I spent a day sightseeing, including the very emotional Oklahoma City Memorial. Everyone should make an effort to visit the memorial. Also visit Oklahoma City, it's pretty and the people are very friendly! We spent our 4th anniversary at the La Quinta Resort and Spa in Palm desert. The entire weekend was spent in the sunshine, poolside in the "Ginger Rogers" pool. It's a beautiful resort with old-Hollywood glamour. Thanksgiving was spent with a mix of old and new friends staying at our house. It was a super fun weekend and the turkey turned out. The Sunday after Thanksgiving, we went to Portland for a week. Dan had bought me tickets to see Bill Murray for my birthday and he was fantastic. We didn't see many live shows in 2017. We saw John Cleese, which was a major let-down and The Game of Thrones in concert, which was very cool. I went to a book signing for one of my favorite authors, Fredrik Backman. I also got to see a free mini-concert when the Old 97's came to the Skype Studio, just two blocks from our apartment. This Christmas and New Years, we will have Felix with us, for his first solo-trip without Zoe. It was a last minute trip, so we don't have any plans, but I know it will be fun to have him here. He loves snow, so hopefully we will have a white Christmas. (I'm writing this early to post in the future, as I know we will be super busy when he arrives.) 2017 was an all-around good year and I'm looking forward to discovering what 2018 brings! I recently had the opportunity to test-drive Trunk Club, a new-ish fashion subscription box from Nordstrom. Nordstrom is one of my favorite places to shop. In 2013, I took advantage of their free in-store personal stylist services at the Arcadia, CA location. This was an amazing way to shop. My stylist, Denise, culled items for me and had them waiting in a dressing room. I was so impressed, I even took pictures of the fitting room from my first visit with Denise. Over a few visits, Denise began to understand my personal style, which brands I favored, and she knew what I already owned. I was heartbroken when Denise left Nordstrom in 2016. She left to pursing a career in medicine, which I know is the best move for her, but I miss shopping with her. She was a zero-pressure sales person and over time, it was definitely like spending the afternoon with a friend. We even got lattes at the Ebar during her breaks. After Denise, I never requested a new personal stylist. I had a few different sales associates helping me, most notably Olivia from the Portland, OR location, but not in a stylist capacity. You head over to their website and sign up. If you're a Nordstrom card holder the $25.00 styling charge per trunk will be waived. If you're not a card holder, the styling fee can be applied to any item that you keep from your box. Additionally for Nordstrom card holders, if you use your card for trunk purchases, you will get your Nordstrom points. This was a huge plus for me; I love racking up those points! Also, purchased items can be taken to your local Nordstrom for alterations. Signing up was a breeze and within minutes, I was contacted by my stylist, Alexandra, via an internal messaging system on the Trunk Club website. Alex is based in Los Angeles and I think, if I wanted to, I could schedule an appointment to meet her in person. Alex spent about thirty minutes discussing my fashion and lifestyle- likes/dislikes, body shape, needs, et...I wanted her to focus on sweaters and layers for my first trunk, with an emphasis on casual pieces that I could wear at my new office job. Alex was very personable and listened to my needs. We also discussed budget and I agreed that she could throw in a few pricier items, to see if I'd be interested. I'm always game to take a look! Within forty-eight hours, I was given a virtual trunk to preview. At this point, I could turn down specific pieces marked for my trunk. I turned down two things and they were replaced by surprises. After that first round of approval, the trunk is set to ship. The entire process, including shipping ( I live in a mountain community), took a week from when I initially signed-up. I was super excited to receive my first trunk and I told everyone in the post office about it. It was a little heavy, but had a handle for easy carrying. Inside, the items were neatly packed and tied with pretty ribbons. I had a personalized note from Alex. 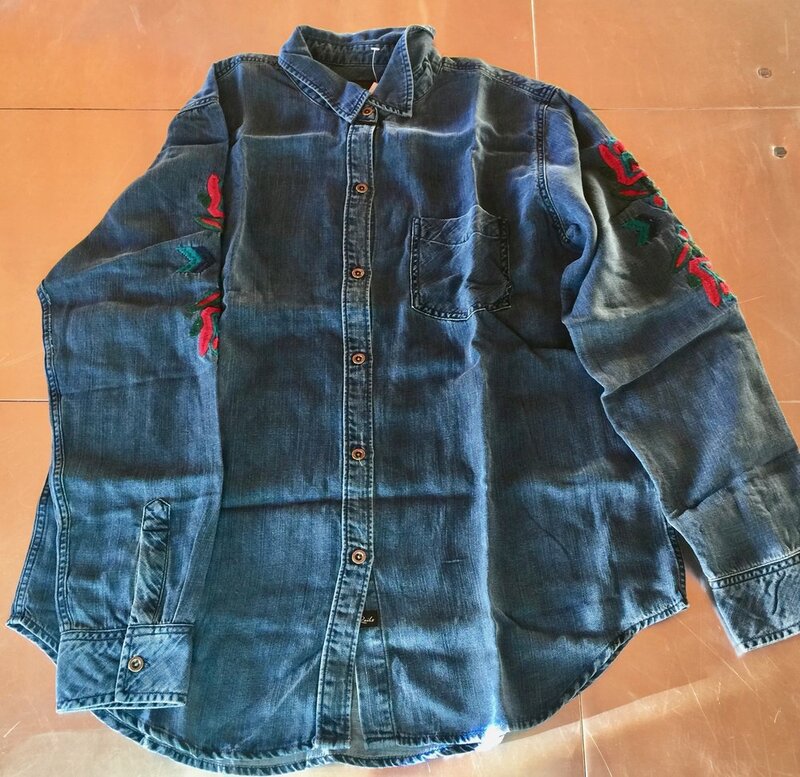 I photographed all of the items, some were very wrinkled and didn't photograph well. I need to ship back the items that I'm not keeping within five days, otherwise I would have enlisted my husband to take better photos, perhaps of me wearing the items. He's away on business, so he missed out on the fun. Next time! Opening up the box is the best part of any subscription service. Even thought I was fairly certain that many of the items would be going back, it still felt like Christmas. My expectations for this first trunk were low, only because Alex doesn't know me very well yet and I think it will take a few trunks for her to have a better idea of me and my likes. 1. Halogen/Cinch Cuff Sweatshirt/ Navy/Medium $59.00. 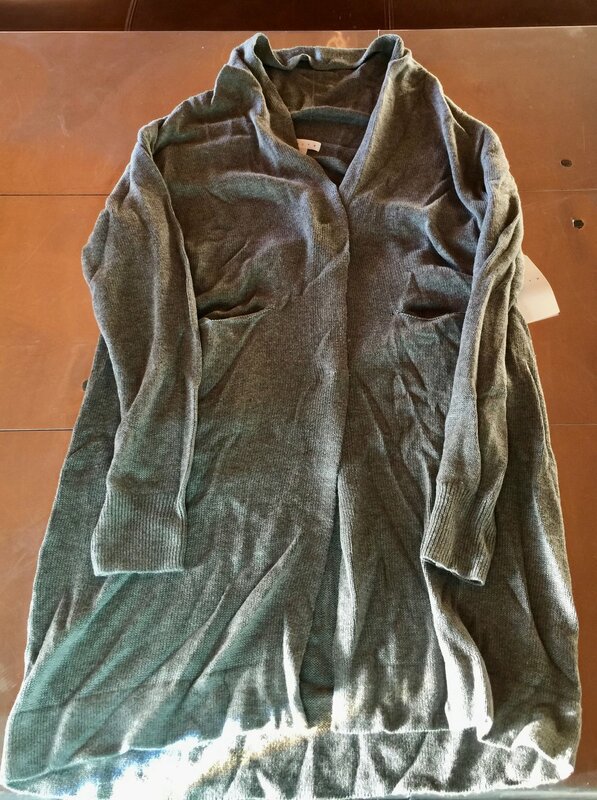 This was enormous on me, with very long sleeves. Odd-fitting. Although it is called a sweatshirt, it wasn't sweatshirt material. The material was a heavy tee-shirt fabric. 2. Joie/Clema Top/Porcelain/Small $298.00 - I love Joie, but it's a pricy brand. 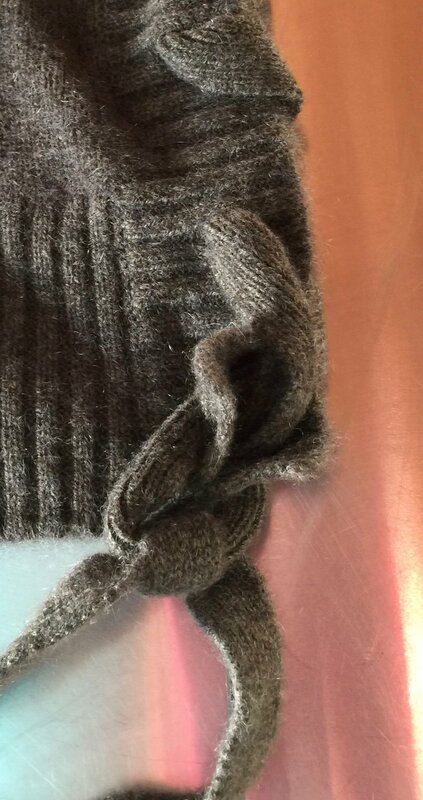 I have to really love the piece and it has to fit perfectly ( or it needs to be on sale) for me to splurge on Joie. This top fit well in every area except the bust. It was cute, but not enough for the price. 3. Leith/Bell Sleeve Sweater/Brown/Medium $59.00 - Leith is one of my go-to brands, but I just can't do the bell sleeve trend. The bell sleeves just get in the way and are fussy. The color is listed as brown, but it was a pretty purple/brown. 4. 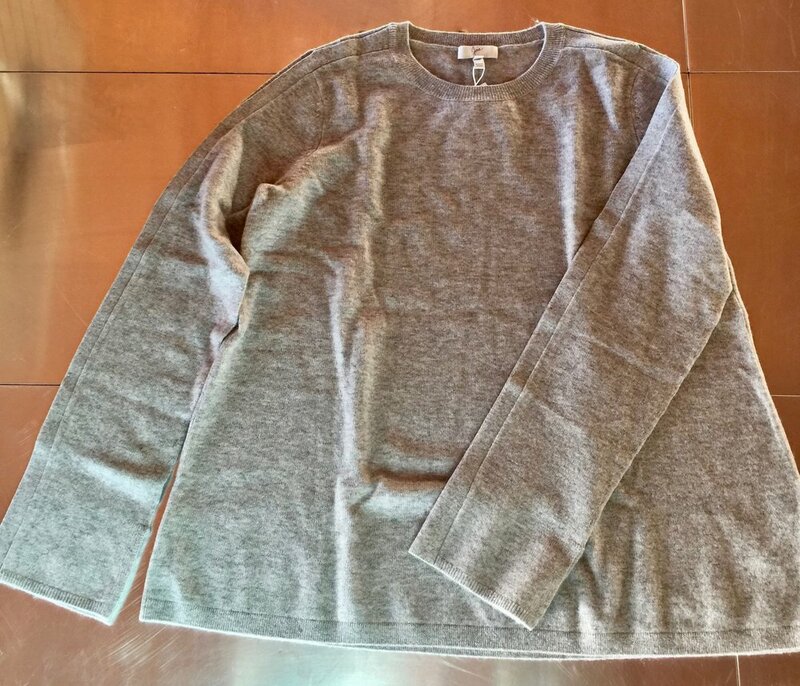 Joie/Amalyn Sweater/Ash Heather Grey/Small $298.00- Great fit and pretty sweater. Not exceptional for the price. It had strange slits on either shoulder, which I don't think would be great for winter. I don't need an air-conditioned sweater! 5. 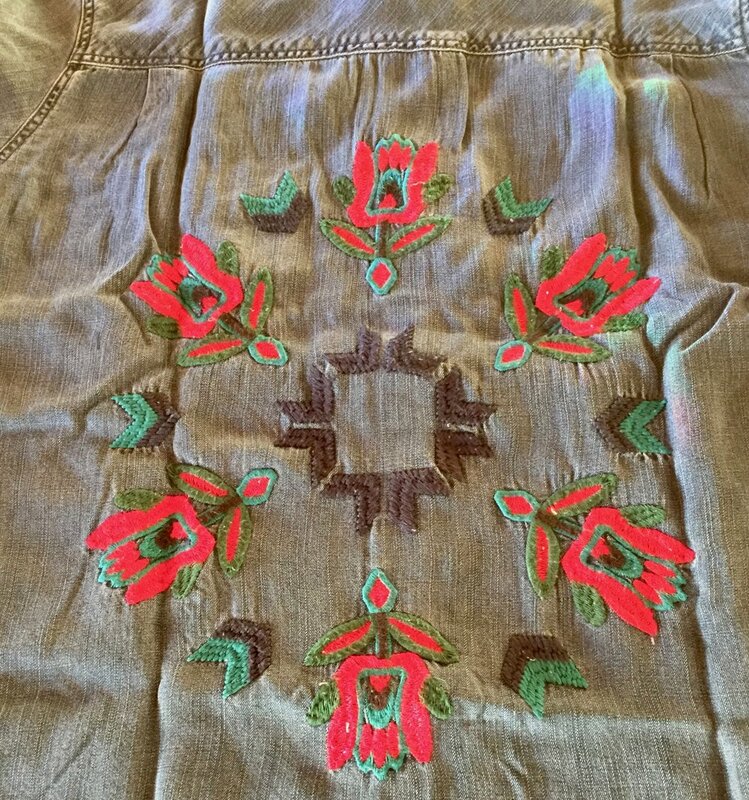 Rails/Ingrid/ Jalisco Embroidery/Medium $188.00 - I saw this and immediately didn't like the design on the denim. The shirt itself fit well and the denim was super soft, but this was just not me. 6. Nordstrom/Cashmere Tie Side Pullover/Green/Medium $249.00 - Love the color (green is my favorite), great fit, and the ties on the bottom are a fun touch. 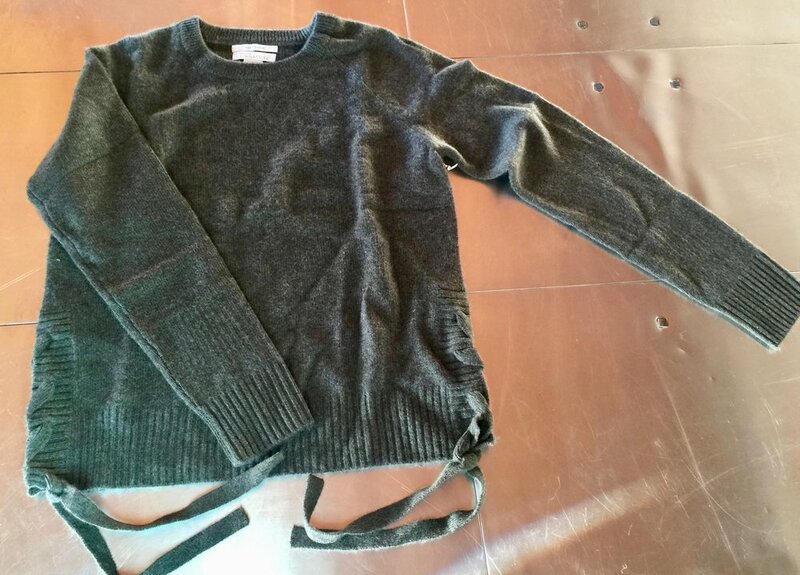 The big problem is this is cashmere and it's just too itchy for me. I can do cashmere blends, but I can't do pure cashmere. 7. Caslon/ 40x80 Lace Love Wrap/Navy $45.00- This is a beautiful wrap, but I have one that is very similar, so it's a pass. 8. BLANKNYC/ Bonded Velvet Moto Jacket/Shadow Boxer (deep grey)/Medium $148.00 - I so wanted this to fit perfectly. I love the style and the fabric makes it unique. The fit was bad. First, it was simply too small, but even if the size had been larger, it still would have been boxy on top. Not flattering. I love the velvet though! 9. Vince Camuto/Dorintina Bootie/White/ 8.5/ $159.94 - I have a lot of boots, but none that are white. I liked that these were different that what is already in my wardrobe. 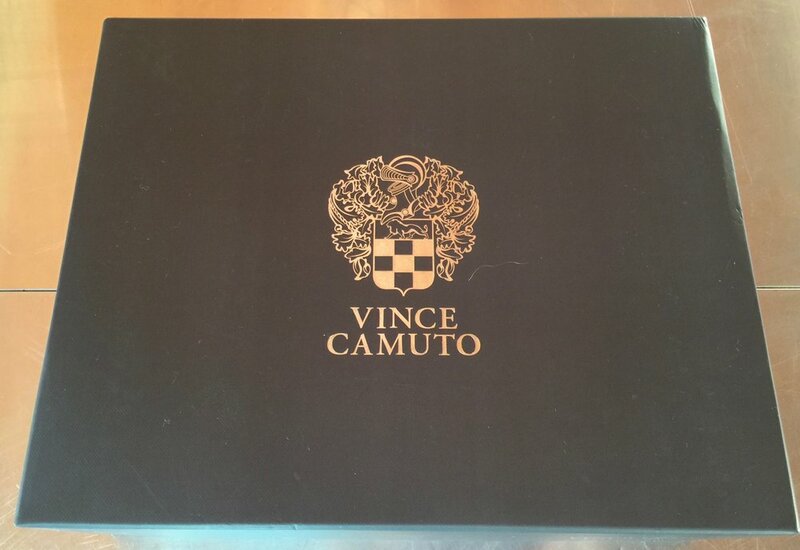 I have a bit of a bias against Vince Camuto clothes from when I worked in retail. I noticed that the quality wasn't great. I had never tried his shoes before. I thought these were fun, but the pointed toe was narrow and pinched. 10. Leith/ Shawl Collar Cardigan/Cloudy Grey Heather/Small $79.00- This is the only item I decided to keep. The picture does not do it justice. It's a great, neutral, mid-weight, long cardigan, perfect for layering. I mainly purchased this thinking it would be great for the office. It looks polished when paired with a light shirt, skinny jeans, and boots. I've packed up all of the items minus the Leith cardigan and I will take them back to the post office tomorrow. Everything ships in the same box and the postage is paid for the return. I just need to seal it up, stick on the prepaid label, and drop it off. Trunk Club even included sheets of super strong tape to seal up the box. If I had wanted, the would have arranged a service to pick up the box at my home. However, since I live in rural community, I didn't think this service would likely be available in my area. I don't mind making the trip to UPS. I've left feedback for all of the items on the Trunk Club website and additionally, I have a phone call scheduled with Alex for tomorrow, so we can go over my thoughts on the first trunk. I've signed up for the monthly trunk refresh, but you can receive the boxes as frequently or infrequently as you wish. The monthly option is said to be the most popular, but if you're an infrequent shopper or would just like to use the service for a certain occasion, you can simply contact them when you want a new trunk. You can theme your trunks to an event, such as a vacation or upcoming party. You can even use Pinterest to create boards and send them to your stylist for ideas. There is so much flexibility and the stylists are very hands-on. A huge bonus about shopping through Trunk Club is you can see how the pieces will fit into your existing wardrobe. The rush of trying things on in a fitting room is eliminated and you can carefully consider each piece. I may have only purchased one item (on my Nordstrom card to get points! ), but I would consider this first trunk a success. 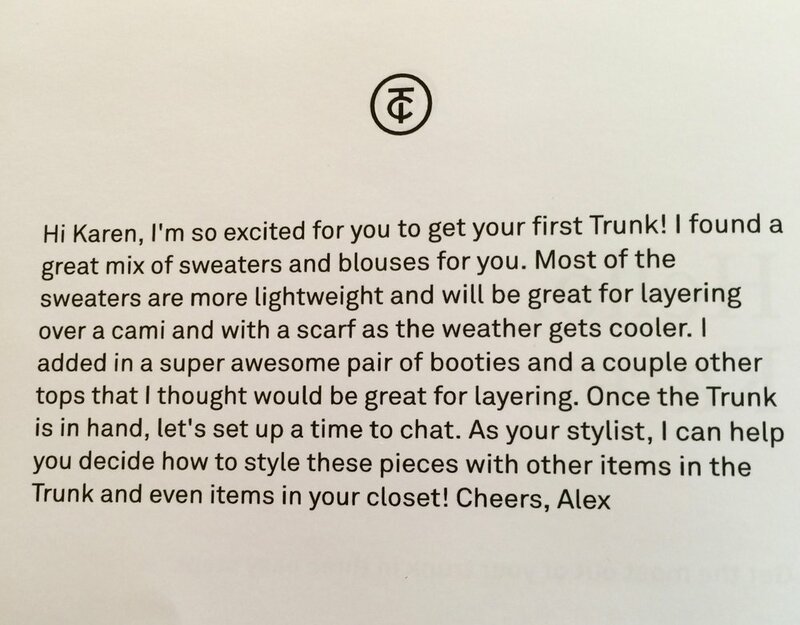 I like the concept of Trunk Club and I enjoyed working with Alex. I'm looking forward to seeing what she includes in my next trunk. Check out Trunk Club for yourself!